International conference in Latin America, on 5-6 July 2018, in Quito, Ecuador. The Instituto de Altos Estudios Nacionales (IAEN) and UNU-WIDER, in collaboration with the EUROMOD team at the Institute for Social and Economic Research (ISER) at the University of Essex will organize an international conference on income redistribution and the role of tax-benefit systems in Latin America, on 5-6 July 2018, in Quito, Ecuador. 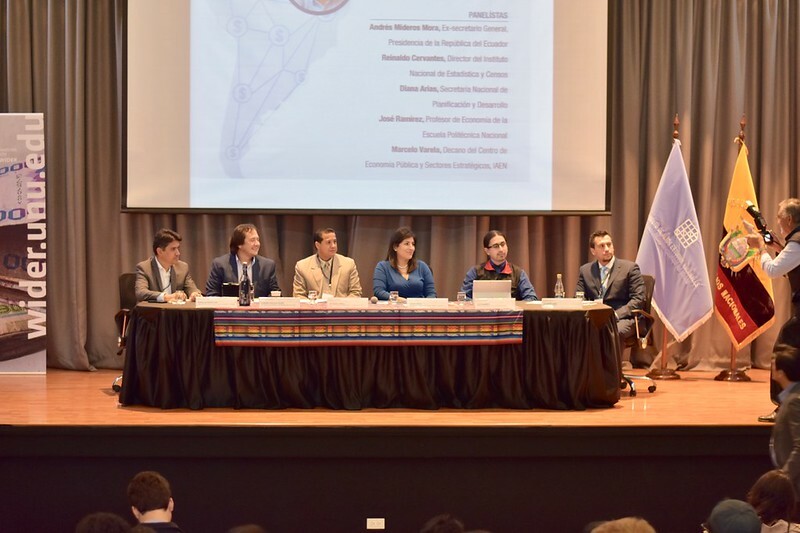 The conference aims to provide a space for discussion between academics and policy makers about the effect of tax-benefit systems on income redistribution in Ecuador and other Latin American countries. The focus is to share knowledge about the most recent research on the role of tax-benefit systems in reducing income inequality and poverty, in particular work using ECUAMOD and other microsimulation models. It is important to create a link between academics and policy makers on recent tools and methods used to assess the role of tax-benefit policies on income inequality and poverty and the use of this tool for ex ante policy evaluation. The conference is part of the activities in the SOUTHMOD project in which tax-benefit microsimulation models for selected developing countries were built. ECUAMOD — the tax-benefit microsimulation model for Ecuador — has been developed in collaboration with IAEN, UNU-WIDER, and the EUROMOD team at the Institute for Social and Economic Research (ISER) at the University of Essex. ECUAMOD and other microsimulation models developed in the framework of the SOUTHMOD model are freely accessible for non-commercial research. The conference will serve an opportunity to promote ECUAMOD as a tool for policy analysis by academics and policy makers. The conference will seek papers studying the role of tax-benefit systems in Latin American countries. The deadline for the call for papers is 6 April 2018. Please find the event page in Spanish here. This conference is part of the SOUTHMOD – simulating tax and benefit policies for development project.